Sandwiched between big games, No. 4 Ohio State took care of business this week against Tulane. The Buckeyes looked strong despite injuries in the backfield and defensive line as they prepare for another test in Happy Valley. Today, we will discuss how Urban Meyer's return affected the offense, Parris Campbell's big day, the significance of Nick Bosa's injury, and Ohio State's rusty play in the second half. After missing the first three games due to suspension, Urban Meyer was back to his full-time duties as head coach this week. He eased back into the swing of things and took control an undefeated Buckeyes squad that ___ Tulane. Earlier this week, Meyer announced that he would take more of a “game manager” role and continue to allow offensive coordinators Ryan Day and Kevin Wilson call the plays. So far, Meyer has been true to his word. Ohio State is still among the nation’s best in total offense at 599.5 yards per game(second) and points per game at 54.5 (third). These marks are greatly outplaying last year’s standards of 506.2 yards per game and 41.1 points per game. Allowing Ryan Day and Kevin Wilson to control the offense has paid off. Dwayne Haskins is on pace to break the single-season passing yards and touchdowns record (Joe Germaine - 3300 yards and J.T. Barrett - 35 TDs). It is also important to keep in mind that Haskins has only thrown 25 passes in the second half this season, as opposed to 90 in the first half. Looking forward, it seems likely that Ohio State will have two backs over 900 yards and four receivers over 600 yards. A third of the way through the season, the Buckeyes' balance is unmatched. Ohio State's backfield and receivers fill every niche on the field. Through four weeks, the Buckeyes have had a different leading receiver each game. 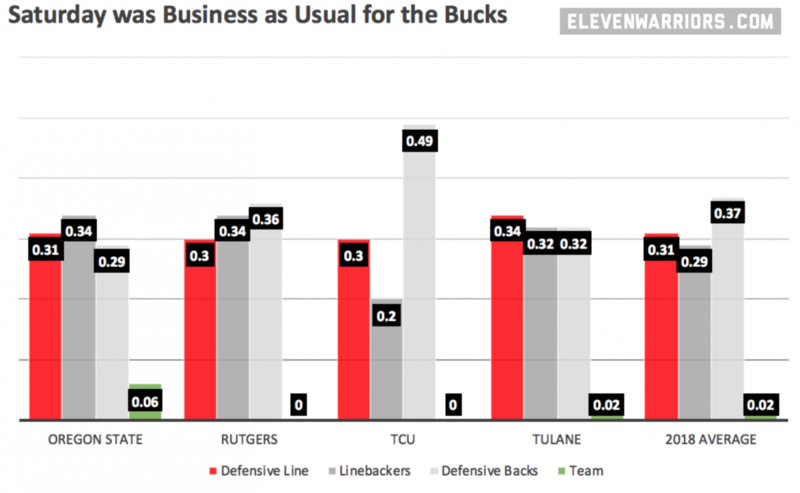 Whether that is due to gameplan or purely coincidental, it has made Ohio State much harder to defend on the perimeter. Against Tulane, it was Parris Campbell’s turn. Campbell caught eight balls for 147 yards and two touchdowns, all of which were single-game highs for the Buckeyes this season. His effort on Saturday catapulted him to the top of Ohio State’s season standings, leading the team in both touchdowns and yards. If leading his teammates was not enough, Parris Campbell had the best game of his career in just a half of football. Campbell’s day also gave him five touchdowns on the year, as many as he had in his previous three seasons with the Buckeyes. He was also given Ohio State’s player of the game award and gave Haskins a perfect passer rating when targeting him. Parris Campbell's day included tough catches and showed off his big play potential, which should have fans salivating. He has always been able to take short passes to the house, but adding the ability to track the deep ball and make tough catches will pressure opposing secondaries more than ever before. Against Tulane, Nick Bosa was not going to be the difference between a win or loss. Against Penn State, that may be a different story. In today's press conference, it was revealed that Nick Bosa would not play against Penn State. Ohio State’s defense was able to take care of business against Tulane, giving up only six points while largely playing underclassmen and backups in the second half. Everything was normal for the Bucks as they beat up on an inferior team. Ohio State's tackle share showed little deviation from the season average despite an injury to the best player in the country. The bright spot of Ohio State’s defense was the play of the linebackers and Isaiah Pryor. Fans and couch-critics, myself included, have given these players a tough time lately. They had their highlights (Pryor’s huge hit in the first quarter) and their lowlights (Borland getting stiff-armed to the ground), but they got better on Saturday. The Buckeyes had their first scoreless quarter of the season in the third quarter. Ohio State was outgained 76-10 and averaged a miserable 0.8 yards per carry. The Bucks only ran 7 plays in the entire quarter, but were sacked twice while holding the ball for less than five minutes. The fourth quarter was better for the offense, as they hit over 130 yards and scored a late touchdown. Tate Martell had an effective day through the air but struggled on the ground; on eight carries, he managed just 22 yards. On defense, the Green Wave managed to rattle off two plays of over 35 yards in the half but did not allow any points. While the second-team defense showed great depth for the Buckeyes, big plays still appear to be the weak point of this team. The experience will undoubtedly be valuable for the talented underclassmen that are starving for playing time, but their offensive execution stalled and the defense struggled to get off the field.